A child literature-based preschool lesson plan focusing on China, as part of an around the world, multi-cultural preschool theme or unit study. 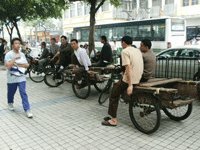 In 2005 when my husband went on a business trip to China, my children and I did a study about China. 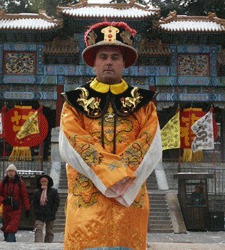 On the days that he went to tourists sites, like the Forbidden City (the Emperor's Palace) and the Terra Cotta Soldiers at Xian, we did a virtual tour and learned about them online! 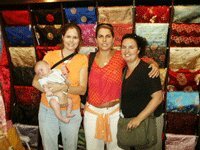 Later in 2005, I was able to accompany him on a subsequent trip with 3 other couples, and my 5 week old baby went with me! Some of our personal photos of our trip are used on this preschool lesson plan page. Locate China on a worldmap or globe. Point out to the children that the shape of the country resembles a rooster, with the head at the northern-most part and the tail feathers in the west. This will help them to remember it and locate it easily. China is the fourth largest country in the world after Russia, Canada and the USA. The capital city of China is Beijing. Locate this city on the map (at the 'neck' of the rooster-shape). Each star has five points and the star on the left is bigger than the other four. Since the design of this flag is so simple, let your children make their own. They could stick gold stars on a small red rectangle that you give them or draw their own stars and colour in the page, if they are able. This delightful story of a little duck and his adventure one night alone on the river, after straying away from his family, illustrates to children the importance of being obedient and appreciating family relationships. Ping is one of our family favourites and this is a great story to use as a gentle introduction to China. Available in soft and hard cover. This is heartwarming story about a small panda that belongs to one of the world's most endangered species. Pi-shu and his mother are forced to search for a safer place to live as humans begin to destroy their natural habitat. This story has a strong environmental theme bringing home the importance of preserving the world's forests. This is a chapter book, not a picture book, but it has lively pencil drawings on every other page. It tells the story of China in days gone by and illustrates the barrier of class in society. A humble servant who saves the Emperor's daughter's life is offered any reward, except the Princess. However, clever Pong Lo outwits the Emperor and turns a single grain of rice into masses of wealth. This is also an illustrated chapter book of about 30 small pages. It is based on the true story Granny Han or 'Han Po Po' as she was known to the Chinese. 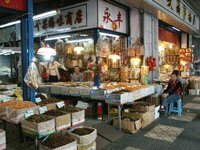 One morning, Granny Han, a missionary in Taiwan awoke to find that her cupboard was bare and having just been robbed of her next three months' allowance, she had no money to go shopping! This story tells the miracle of how Granny Han got her breakfast! A heart-warming story of a woman who makes a little origami girl. The wind blows the paper doll away and she has some adventures beyond the safety of her home...and then comes the happy ending. Legend has it that Lady Xi Ling Shi, the 14 year old bride of the Emperor Huang Ti, the so-called 'Yellow Emperor' first discovered silk in 2640 BC. According to Confucius, as she sat drinking tea under a mulberry tree, a silk cocoon fell from above. She noticed the delicate fibres start to unravel in the tea and so has been credited as the first person to 'reel' or unravel a silk cocoon and use the filament to create a yarn for weaving. The mulberry silk moth is indigenous to China and the Chinese, realizing the value of the beautiful material they were able to produce by weaving silk thread, kept its secret safe from the rest of the world for more than 30 centuries. If you are able to find any, allow your children to keep some silkworms and observe the life cycle of the silkworm moth. Use this free printable notebooking page for your children to record their silkworm lesson. Let them dictate and draw the life cycle of the silkworm on the printable worksheet. The Chinese are known for eating a wide variety of foods, some of which seem very strange to westerners. The staple foods however, are rice and noodles accompanied by steamed vegetables or stir-fried meats. 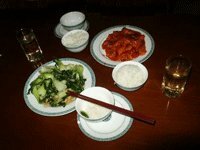 Below is a picture of a typical Chinese meal which we ate in a local (not touristy) Chinese restaurant. It consisted of two bowls of rice, sweet and sour pork, steamed vegetables (unknown) and warm Chinese tea. Give your children a taste of China by serving rice or noodles in bowls with chopsticks accompanied with steamed vegetables. Alternatively, go out for Chinese! The Lantern Festival or Yuanxiao Jie is a traditional Chinese festival, celebrated on the 15th of the first month of the Chinese New Year. The festival marks the end of the celebrations of the Chinese New Year. This is a fun festival where people flock to the streets with a variety of lanterns under the full moon, watching lions or dragon dancing, playing Chinese riddles and games, and lighting up firecrackers. 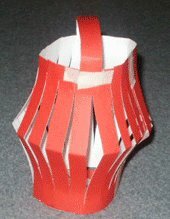 Let your children make a paper Chinese Lantern. Do you have ideas to share on this theme? Do you have an Around the World idea, activity or resources to share? It will take you a few minutes to submit it below. To thank you for your contribution, you will receive a free copy of my Ocean Theme Lapbook. Your story will appear on a web page exactly the way you enter it here. You can wrap a word in square brackets to make it appear bold. For example [my story] would show as my story on the web page containing your activity. What countries around the world have your kids studied? You are invited to upload a photo and share your kids' around the world preschool themes too!